In stock -This product will ship today if ordered within the next 12 hours and 46 minutes. Jason`s All-in-One Body Wash makes it easy to get clean from head to toe. This formula removes dirt, sweat and odour from face, hair and body, leaving you squeaky clean without any residue. Aloe Vera moisturises skin and prevents dryness. For a kick, Cedarwood, Pine and Eucalyptus Oils provide a fresh, outdoor scent to boost your day. Aqua (Water), Aloe Barbadensis Leaf Juice(*), Sodium Laurylglucosides Hydroxypropylsulfonate, Sodium Cocoyl Isethionate, Glycerin, Cetyl Alcohol, Xanthan Gum, Abies Sibirica Oil, Citrus Aurantium Bergamia (Bergamot) Fruit Oil, Citrus Aurantium Dulcis (Orange) Peel Oil, Citrus Limon (Lemon) Peel Oil, Eucalyptus Globulus Leaf Oil, Eugenia Caryophyllus (Clove) Leaf Oil, Juniperus Virginiana Oil, Lavandula Hybrida Oil, Pogostemon Cablin Oil, Ricinus Communis (Castor) Seed Oil, Humulus Lupulus (Hops) Extract, Macrocystis Pyrifera Extract, Citric Acid, Coco-Glucoside, Glyceryl Oleate, Sodium Chloride, Phenoxyethanol, Potassium Sorbate, Sodium Benzoate, Eugenol, Limonene, Linalool. (*) Certified Organic Ingredient. Apply to damp skin and wet hair in the bath or shower. Gently massage into a lather and rinse clean with warm water. 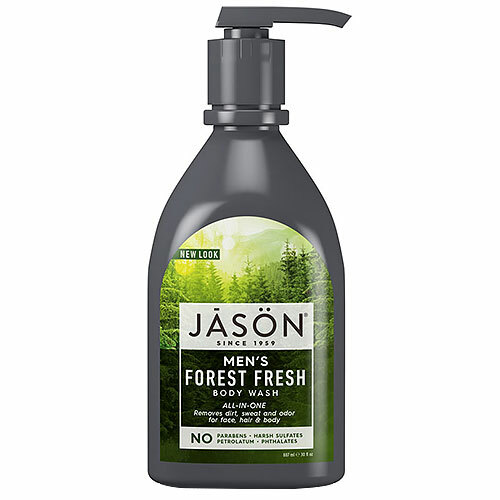 Below are reviews of Jason Men`s All-In-One Body Wash - Forest Fresh - 887ml by bodykind customers. If you have tried this product we'd love to hear what you think so please leave a review. 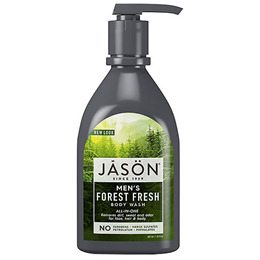 Jason`s All-in-One Body Wash makes it easy to get clean from head to toe. This formula removes dirt, sweat and odour from face, hair and body, leaving you squeaky clean without any residue.